This is how the Moon looks under the microscope! 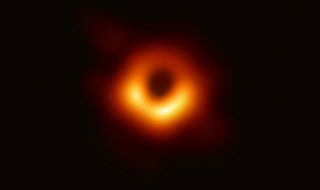 Unlike our other neighbors in the Solar System, we have a pretty good idea of what the Moon is made of and how it’s put together, as we have an extensive suite of samples brought back from the Apollo Lunar landings. The Apollo program returned 380.05 kg of lunar rocks and soil, and most of the samples are stored at the Lunar Sample Laboratory Facility. 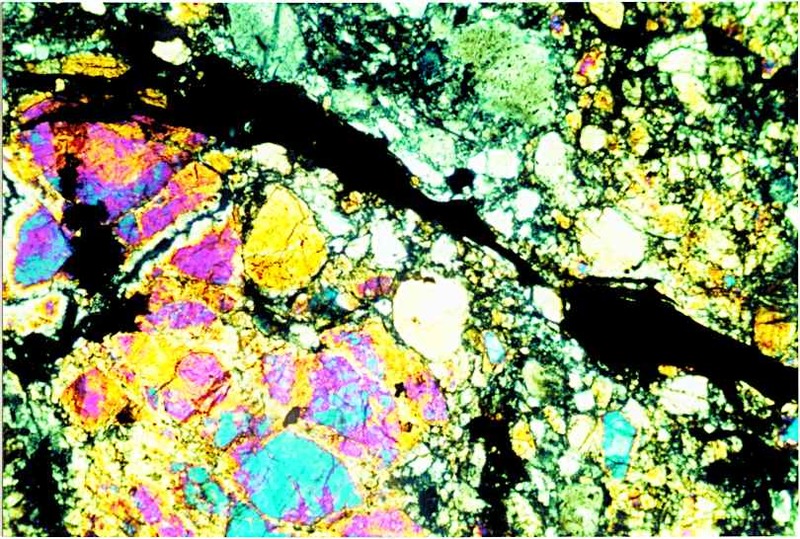 The samples of rocks, breccias, and regolith were polished into thin sections, allowing for optical geologic studies to be performed on them. Map of Apollo lunar landings. Similar to our planet, the Moon has a layered structure, with its core surrounded by a mantle and a thin crust. 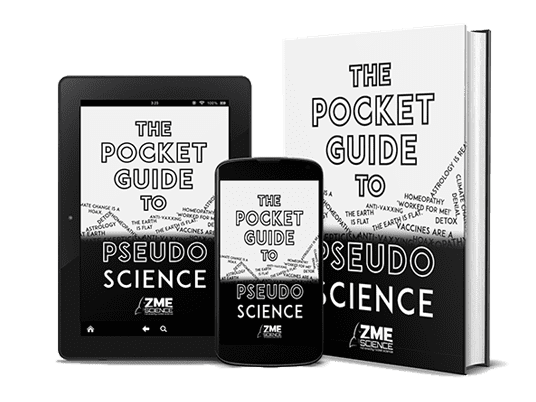 Geological processes that form rocks and bodies of rocks, such as fractional crystallization work similarly on the satellite as they do on our planet – with the notable exceptions of tectonics. 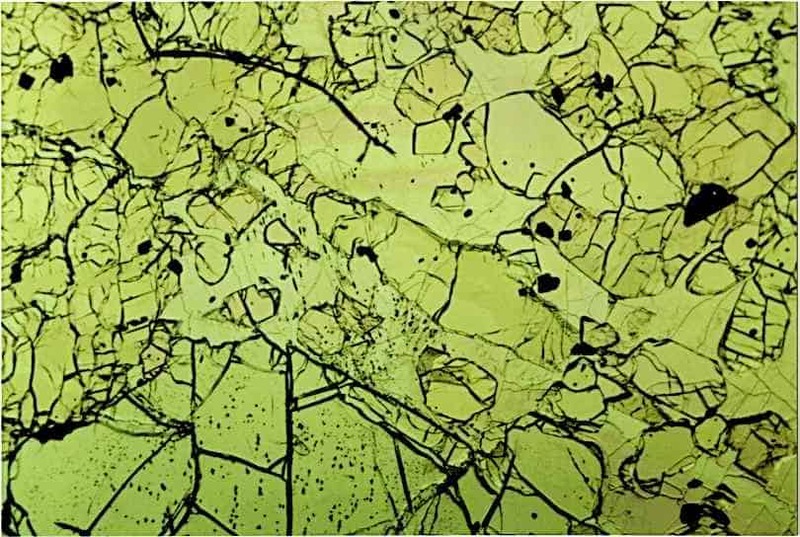 The geological school that studies microscopic crystals is called petrography. 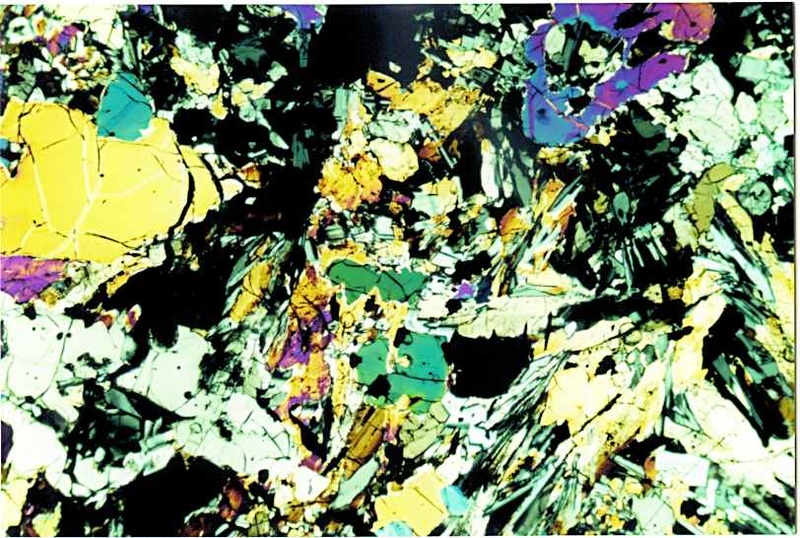 Geologists use a polarizing microscope to study the optical properties of the crystals to observe behaviour that ties directly to their structure and chemical properties. 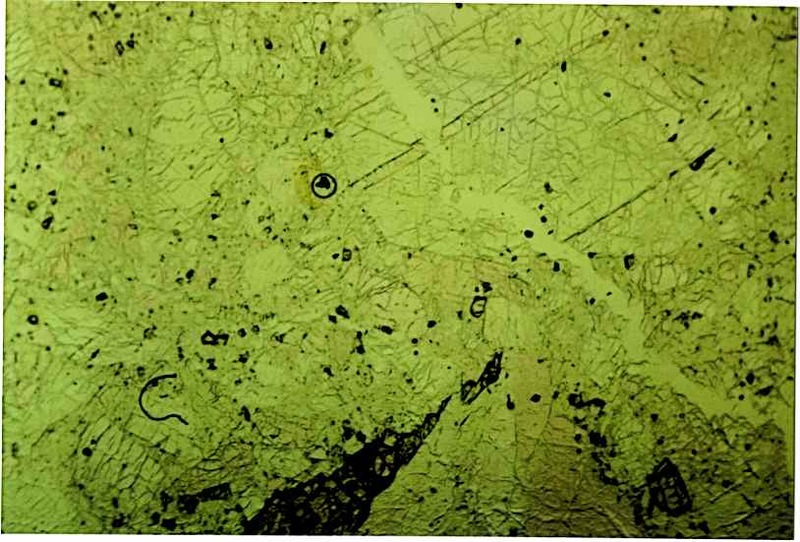 The following photos show the same thin sections, in the same position. The only difference between them is that they are once taken with only one polarization filter in place, then with both of them in use. Lunar basalt section viewed with one polarizer. 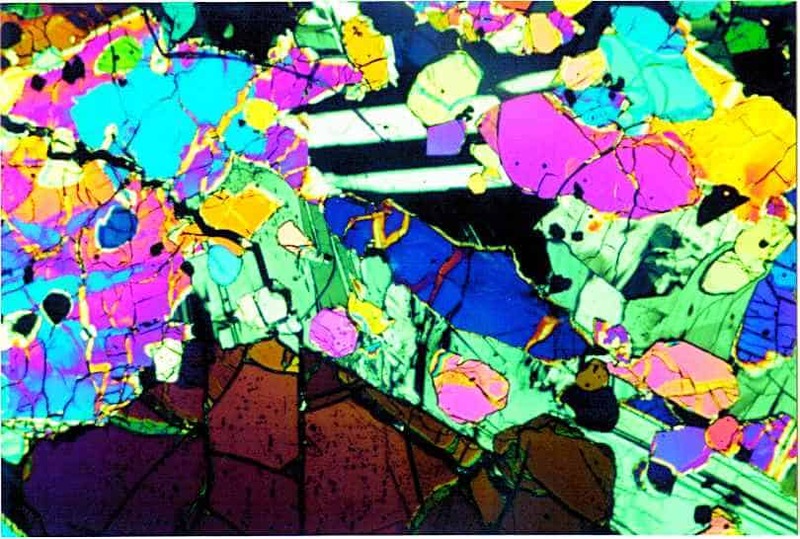 The same basalt section viewed with two crossed polarizers. Pwetty. Lunar basalt – one polarizer. 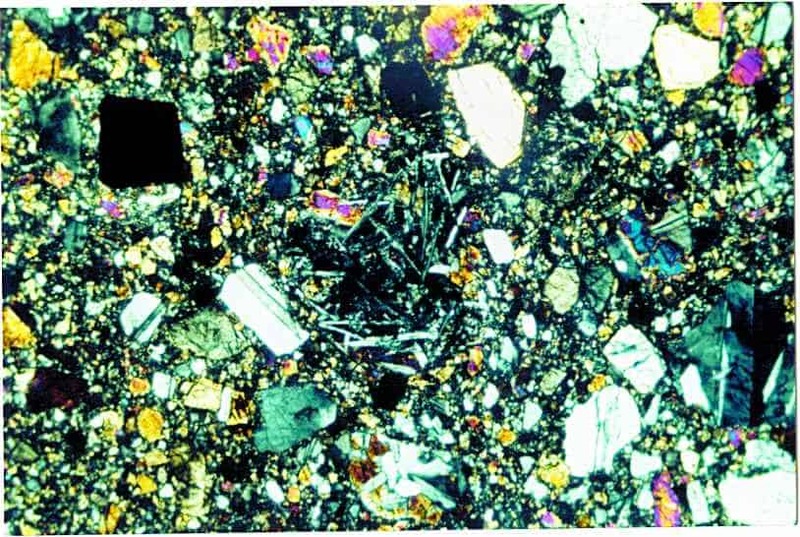 Lunar basalt – crossed polarizers. The lavas that solidified to form these volcanic igneous rocks were generated by shock-induced heating associated with the series of gigantic meteor impact events that formed the mare basins. The most recent mare impact occurred approx. 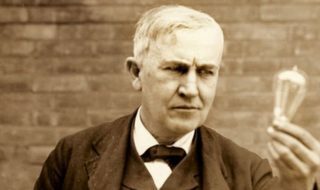 3.0 Ga; the oldest, around 3.8 Ga. Lava erupted in the crater basins and filled them, and because of the vacuum of space, cooling proceeded relatively slowly, permitting specific textures to develop. 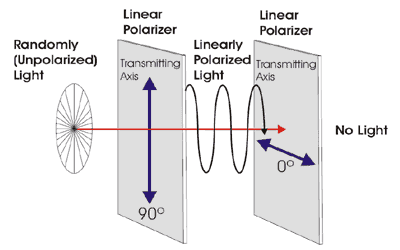 Polarizing (or petrographic) microscopes use two layers of cross-polarizing lenses (or nicols). The first one blocks the waves of white light that do not vibrate parallel to it’s transmiting axis, to assure that the light that passes through the crystals vibrates uniformly and thus the interference (the bright colours the crystals take in the second picture) is caused only by the properties of the crystalline matrix. 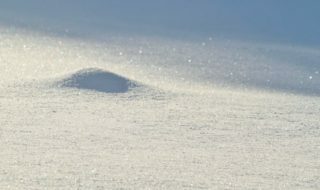 Light passing through a single polarizer loses at least 50% transmission, depending upon the grade of polarizer used and the polarization requirements. 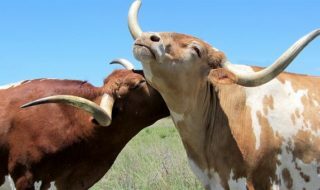 How a polarization filter works. The second filter is placed with its transmitting axis at a 90 degree angle to the first one. 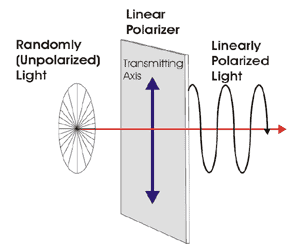 Crossing the two linear polarizer axes at 90 degrees to one another can produce near absolute blockage of light or cancellation, called extinction. Looking through the microscope with crossed nicols with no crystal section between them, you would only see darkness. Lunar Norite – one polarizer. 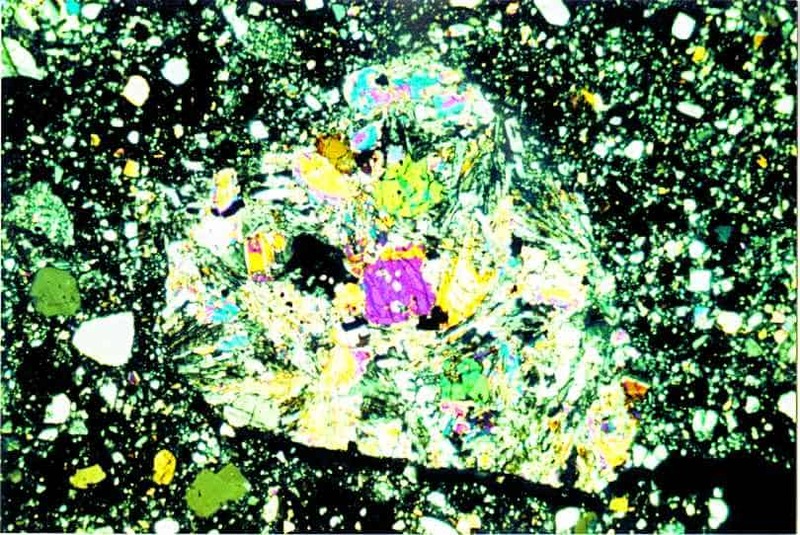 Lunar Norite – crossed polarizers. Lunar Anorthosite – one polarizer. 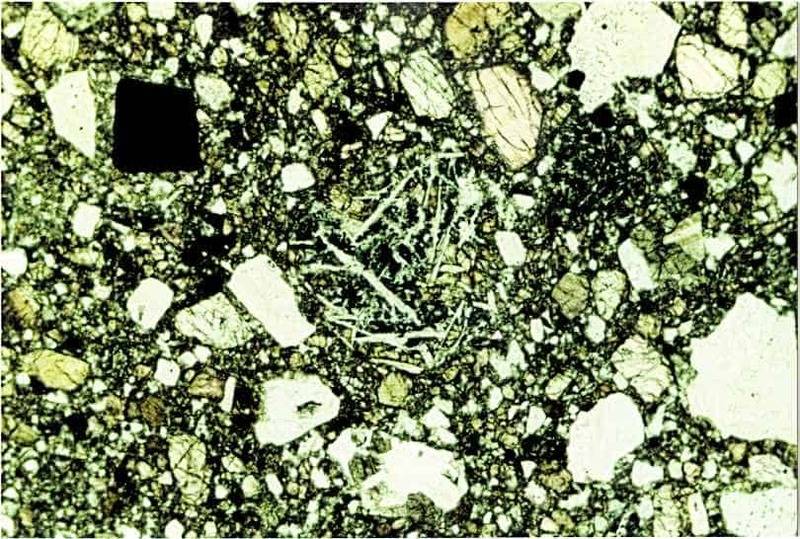 Lunar Anorthosite – crossed polarizers. The original crustal rocks of the Moon, which constitute most of the Lunar Highlands. They are rich in the mineral Feldspar; Anorthosites are Feldspar-only rocks, Norites are Feldspar-pyroxene rocks. These rocks are very old (4.0 to 4.4 Ga) and show substantial evidence for shock metamorphism due to a long history of meteor impacts on the lunar surface. Most of these rocks show a fractured, brecciated texture, and some contain glass formed by the shock metamorphism of feldspar. 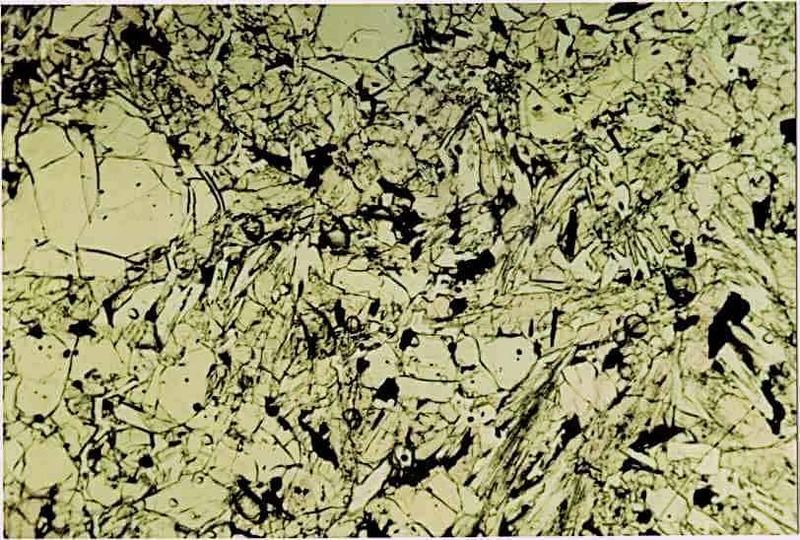 Lunar Impact Breccia – one polarizer. 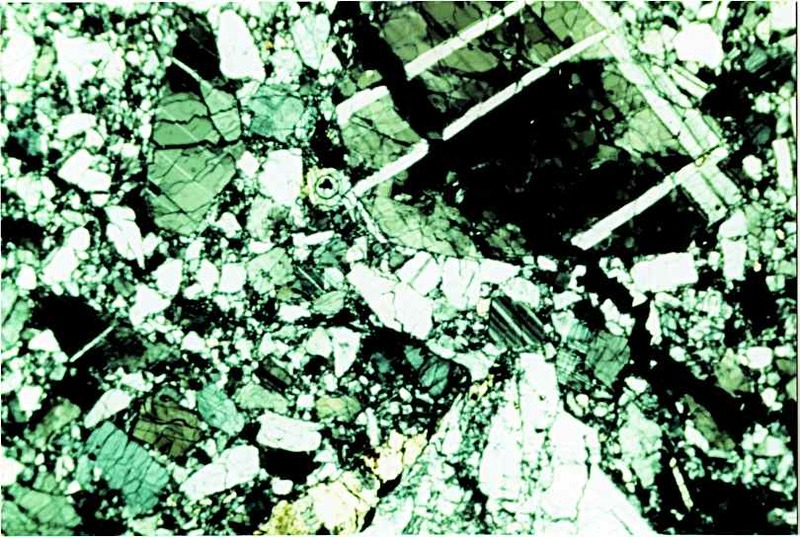 Lunar Impact Breccia – crossed polarizers. Lunar Breccia – one polarizer. 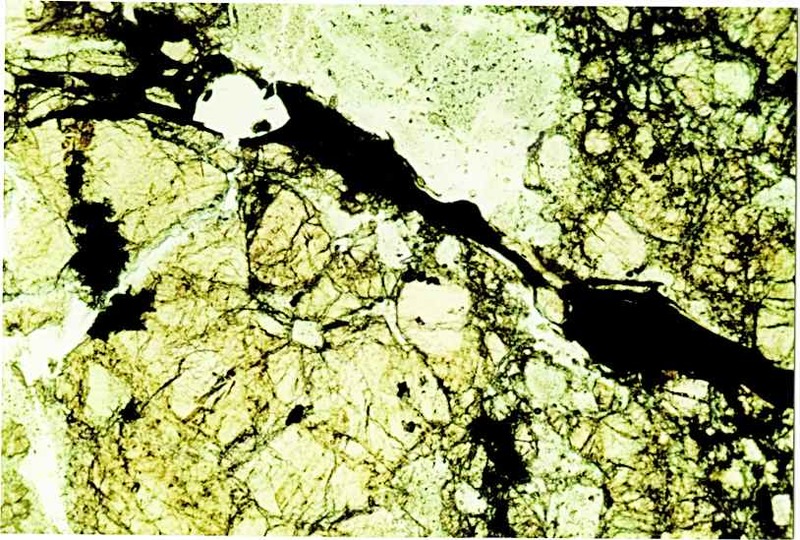 Lunar Breccia – crossed polarizers. 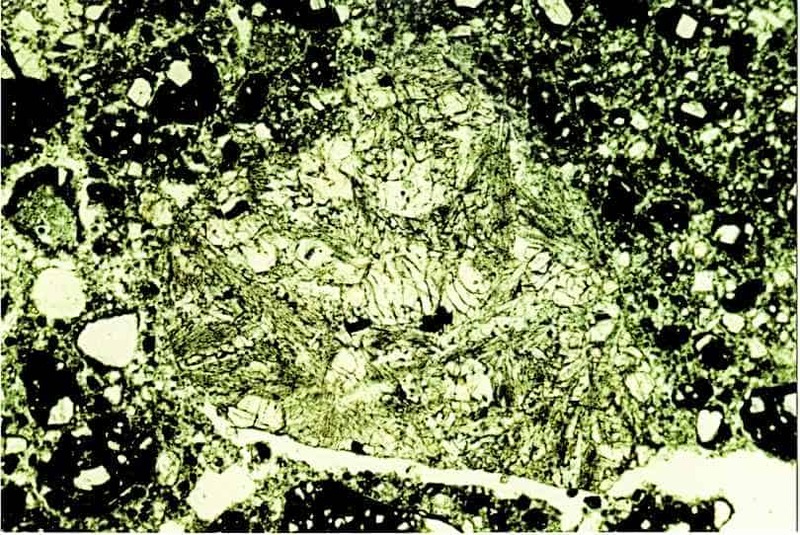 Perhaps the most common rock type on the Moon today, however, are Impact Breccias – rocks made from the debris of the many meteor impacts which have occurred in the Moon’s history. These rocks form when fragments of shattered rock are either smashed together through collision, sintered together by the heat of collision, or cemented together by infiltrating impact melt. Breccias are said to be “Monomict” if they contain pieces of only one kind of rock, and “Polymict” if they contain more than one kind of rock fragment. Most Lunar breccias are polymictic by strict definition, but they are typically dominated by fragments of the local country rock. Some breccias cover large regions of the lunar crust, and can be mapped on the Moon via telescope. 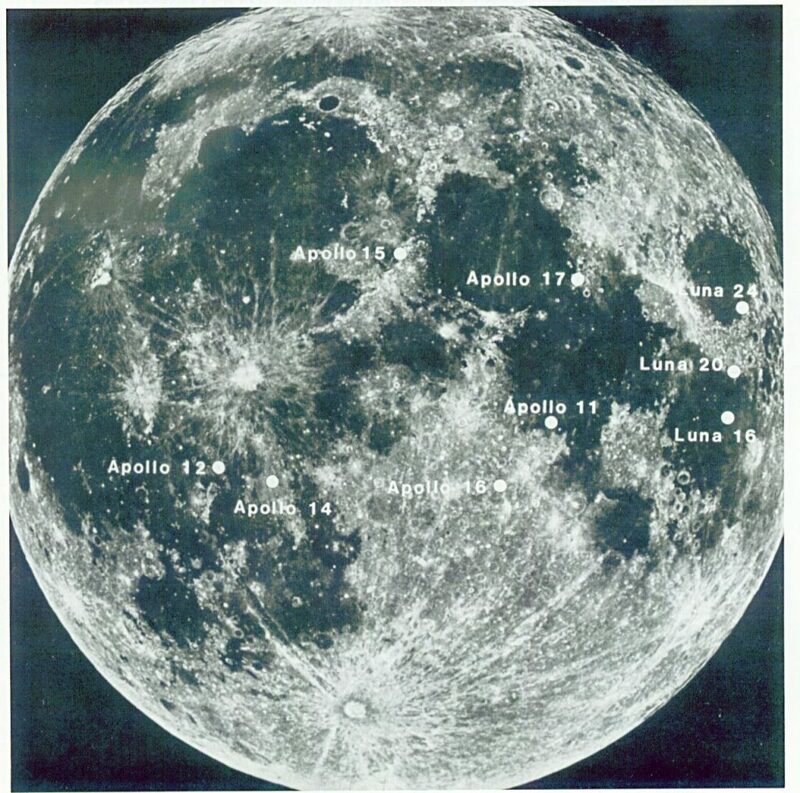 These Lunar “formations” were early targets for exploration in the Apollo program.